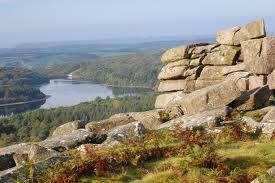 Dartmoor is the largest and wildest area of open country in Southern England but it is much more than that. Whilst many people come to Dartmoor to enjoy the beautiful scenery and to recharge their batteries, many come to get active! With over 450 miles (730km) of public rights of way, there is an abundance of walking routes to suit all tastes and abilities. 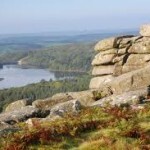 Dartmoor also boasts a variety of cycle routes, both on and off road, making it as challenging as you want it. And there is also the small matter of horse-riding, climbing, letterboxing, geo-caching or kayaking. For details on these activities take a look at our information leaflets located in the Study at Boreat Manor. Purple, heather clad moorland, wide open landscapes, rushing rivers and obscure stone tors shape the landscape of Dartmoor. But that is just one small part of a big picture. There are rolling valleys, bogs and wetland, waterfalls and well trodden paths, ancient, eerie forests and lonely ruins. Sometimes ominous, challenging, extreme, sometimes welcoming, heart warming; always breathtaking, always changing, the landscape of Dartmoor is alive in every sense of the word. Dartmoor has an abundance of wildlife some rare and some as common as the day is wet but all cherished; Dartmoor ponies, cattle, butterflies, birds of prey, otter, grey squirrels and deer live amicably side by side. There are many stories of beasts and large wild cats roaming the moor but these beasts are all part of the myths and legends of Dartmoor. If you want picture postcard Dartmoor villages with thatched cottages and rambling lanes? 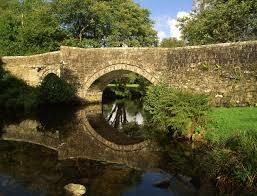 Try Lustleigh or Moretonhampstead, How about historic market towns with traditional stores, tearooms and crafts? Head to Tavistock, Bovey Tracey or Okehampton. What about something a bit different, a little bit quirky? It’s got to be Widecombe-in-the-Moor. Maybe you want folklore, and Dartmoor myths and legends? Princetown is the place to be. 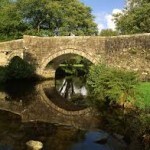 Tiny hamlets, bustling towns, or pretty villages, Dartmoor is thriving, lived in, real. The pony is as much associated with Dartmoor as the tors, bogs and swirling mist. 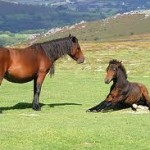 The sight of new born foals in late spring out on the moor is a sight that many tourists (and locals) love to see. 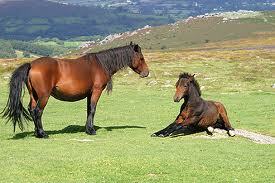 Ponies have lived on Dartmoor for a very long time. An archaeological dig uncovered hoof prints as early as the Bronze Age. The Dartmoor Pony is now a rare breed but can still be seen wandering across the moor and meandering along the lanes. There was a fear that the pony might disappear from the moor altogether. However, Dartmoor National Park Authority has worked hard with all interested parties to try to ensure that there is a sustainable future for all ponies on Dartmoor. The Authority has been successful in setting up not only support for all breeds on the commons, but worked in partnership in ensuring that the future of the native breed – the Dartmoor Pony has a sustainable future in its native habitat.